Finished watercolor sand dunes painting. How to watercolour. Our watercolor sand dunes painting is nearly finished. All that is left is painting the shadows and the little tufts of grass and small twigs. Mix a tea strength mixture of French Ultramarine and Alizarin Crimson – leaning towards the blue. Create a green with of Cobalt Turquoise and Aureolin to the same consistency. With these mixes ready start painting in the shadow areas from the left hand side (if you are left-handed start from the right hand side). For the shadow areas along the top of the sand dunes drop in a little of the green mix near the top of the dune to give some reflected green light in the shadow area. Also drop in some of the green colors used in the foliage to break up the hard edge of the sand dunes between them and the foliage. As you paint the smaller shadow areas, paint in the grasses using an upward flick of your rigger or other fine pointed brush. Paint these grasses while the shadow area is still wet so you get a soft edge at their base. The grasses are painted with very little water in the mix. You can also paint the shadow of some of the grasses at the edge of the shadow areas furthest away from the sun. 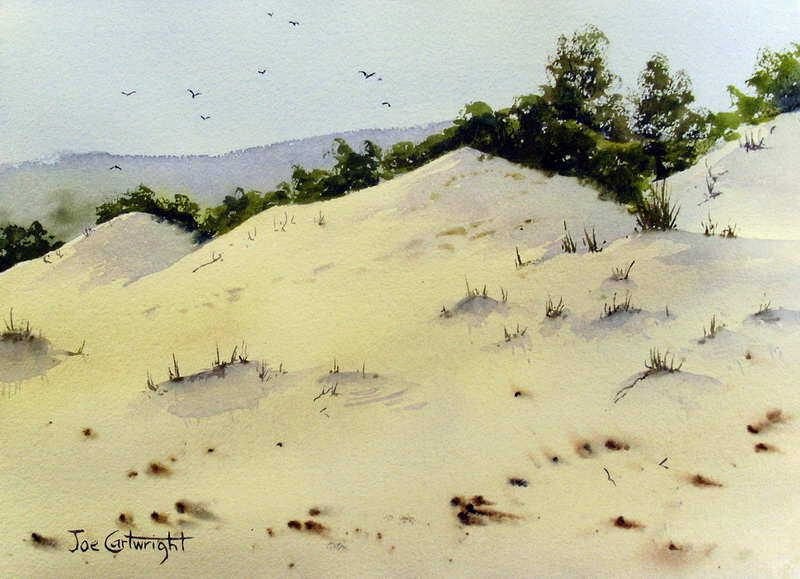 Now look over your painting and add any twigs and other grasses where you feel they will add to the composition and our watercolor sand dunes painting is done!